Topiary balls, shrubs and trees are ideal as a talking point or feature in your garden or even indoors in pots. If you are not sure about organic topiary trees inside your home, consider lifelike artificial topiaries that are easy to maintain and look great in any conditions. 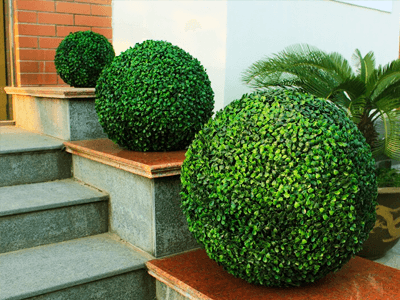 Maybe you have heard of topiary before but are not really sure how to fit it into your home and whether the amount of maintenance needed to maintain stunning topiary balls is more than you have to spare. Have you ever wandered past unusually shaped plants in people’s front gardens and wondered why they had grown that way? Often they are ball shaped, but they can be fashioned into any shape imaginable. You may have seen this trend in various places around Australia, and the name for this trend is topiary, and it is not new, just becoming more common. The origin of topiary hails from the 18th century. Originally called the art of the tree barber, but also referred to as leafage sculptor or tree mason. Simply defined, living trees and shrubs are trained over time into decorative shapes. As the name suggests, topiary balls are round with on the top of thin stems or trunks. Evergreen shrubs with thick leaves like box yew and Cyprus are ideal however plants such as holly, rosemary and box honeysuckle are also popular. Creating a topiary tree is an art form and if you would like to know how to create your topiary ball here is a step by step guide that is easy to follow. Every topiary plant has basic needs according to its species such as watering, fertiliser and protection from the elements. Creating the shape that you want is the first step in making your topiary. As organic topiaries are living organisms, they need regular clipping to ensure they remain in the shape that you want them to. Most plants will need clipping once a year, and you will need to use the tool that fits the size of your plant. Clip outdoor topiary shrubs in Spring not when it is either very hot or cold and use the frame to guide you to the desired shape. Crafty topiaries: Non-organic topiaries can be artificial plants, or they can be crafted decorations for special occasions such as Easter, Christmas or birthday parties. You can make them from ribbons, fruit, shells, pumpkins – anything that can mimic the shape of a topiary ball.